I started my first real business at age 26. Before the internet was king and customer service in my case were just words. I started my first business in a historical time. A special time before everything was recorded for everyone to see forever. I am ashamed of some of the things I was able to get away with back then. Like not calling back a customer because I had a hard time with conflict in my immature 20s. I wanted everyone to think I had it all together and I truly believed the timeless motto: “Fake it till you make it”. I always wanted people to think I was something I was not. I let people believe I was a way bigger company than I really was. At a young age I employed older sales men that led me to believe the customer was both always right and not very bright. We spent hours and hours educating every customer that came into my store on the finer details of our exclusive product and it’s superior nature. It’s place in the market as we situated ourselves as the place to came for advise. We were the one’s you came to when it was time to buy as well. The good old retail store. In 2008 I shut the doors. It took me a long time to reflect on why we failed because I blamed the housing bubble. What a great scapegoat for me. I took a job for 2 years while I waited out the rebound and waited to reboot my retail store. Funny thing, it was never the same. I was replaced on the showroom floor by youtube videos. Yelp was king of customer service. I had no idea why at the time but I decided to pivot that retail store into service and it worked just well enough to sell it. Something I really enjoyed about my former business was the advertising and public relations part of my small local retail store. Now in 2018 we call it Marketing, Graphic Design and Social Media. My family was well positioned in the print and direct mail industry in Ranch Mirage in sunny southern California. My Uncle Greg had built onto a now 30+ year old business. He had something that I wanted. He was winning the marathon that is business. He has built a legacy for himself. So I made it my mission to learn from him how he does it and so I naturally came under the wing of my uncle Greg as he taught me the ins and outs of the print and direct mail industry. He is a quite man that rarely ever gives an order to his team. He is the type of leader with people who he hand picked to surround himself with. A team that makes coming to work a joy for each and every one of them. He instills in them trust, integrity and hope that they can aspire to do great things every day. He was teaching me about my new calling while I observed his everyday actions. He was teaching me every chance we had. I would be so excited to be able to fly down to see him and just spend the day working in his office just to soak up everything I could. It took me 2 years to open my office in Northern California. Just an hour and change north of Sacramento. It was pretty tough changing industries. It was so rough and yet some how I managed to attract enough business to survive and thrive as the business world changed right before my very eyes. How do you win the modern marathon that is business? I can see that their is no room in the modern business world anymore for the old ways of fake it till you make it. If a business doesn’t look in the right place for their place in the community they are done before they start. I’m not talking about fearing bad reviews on Yelp or being concerned with your online presence. It is so much more than that. It all comes down to the roots of the business. It all comes down to the people. After all, isn’t that what a business is? A team of people working towards a common goal. What do the people believe in and how do they make their customers feel? This has consumed me for over a year. Some companies are trying to win their race as new entrepreneurs while some are in roles in companies as leaders. What ever the role in your company or it’s size, it all comes down to looking into the depths of our humanity and taking inventory of what do we value. Culture will dictate every facet of how a company operates and how they run their race. If a company only believes in money the modern business world will eat them alive and spit’em out cold. How do you win the marathon that is business? My industry in print is changing fast and technology has made our lives both easier and more robust at the same time. Most sectors of printing have decreased dramatically. 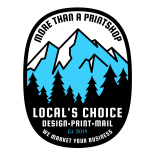 Ask anyone and they will tell you that printing and direct mail especially are going away as everything goes digital. Mail became email and with it went the way of the mail order catalog sales to e-commerce websites. Now as the future is here even those mediums are going away as Google Voice and Alexa start to deliver your toothpaste with two words from you as you get dressed in the morning. It seams scary but so did the internet to your grandparents and that was just dial up AOL. SEO and banner ads are replacing radio and television advertising as everyone fast forwards through commercials with their DVR or more importantly, streaming video has become the norm in 85% of modern households. 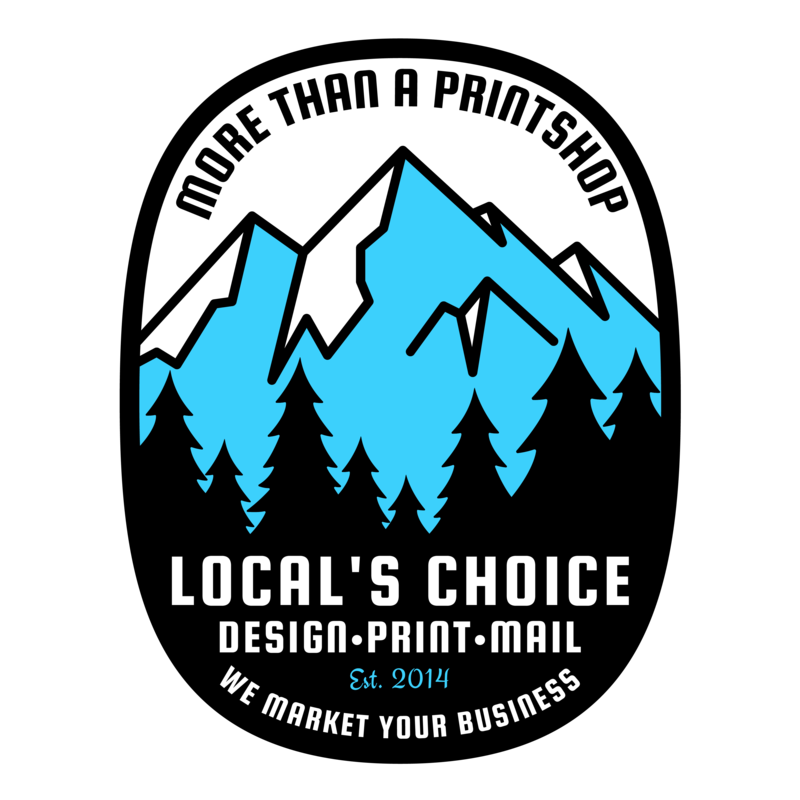 So why in God’s name would I own a print and direct mail company? Just like these examples for instance; email marketing and DVRs first flourished yet they have also fell victim to technology. Email marketing has fallen victim to simple junk mail filters and regulations as DVRs are becoming obsolete as live TV in most homes goes slowly into the darkness. The one thing that hasn’t changed in every household in the US is the mailbox. As the pendulum slung itself away we invested heavily into modern technology in digital printing. As the pendulum now swings back to the mailbox swiftly we have made it very affordable to print a special picture and message for each and every postcard or mail piece that speaks to each recipient as an individual person. Very personally and intimately. We encourage or clients to send personal hand written messages in their campaigns. Now with all the data we have at our fingertips we can now dig way deeper than ever before into not just mailing lists for geographic and demographic information but now we are able to get into psychographic information for potential new clients and client retention. A great example of this would be a realtor looking for a mailing list to send out a postcard. A smart realtor would get a list of potential clients that would be most likely to sell their home based on geography and how long they have lived in their home. A winning realtor will get a list of potential home listers based on how often they search their own address and neighborhood on Google and Zillow, send them a postcard with a picture of their own home on it with the caption “Thinking of selling? Give me a call today to find out what your home is really worth”. A winning realtor would follow up with a personal phone call and some good old fashioned farming. When that realtor signs and sells these listings they will follow up with stories on social media and shoot a video making their very happy client the real star of the show. Every legacy business will have a track record of innovation and execution often while always looking towards their core values for guidance and strength. These businesses will be around to help this winning realtor’s grandchildren as they continue a legacy of selling homes. As long as we keep in mind that our communities are filled with very smart and caring potential new clients we will always strive to meet the expectations that our core values and culture demands. This is why I chose to publicly publish my companies core values. They are that important to us that we want everyone to know. 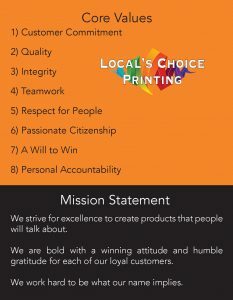 If you get the chance to visit our office you will find a copy of our Core Values and Mission Statement at every workstation, every doorway and every phone. It is a reminder to us as we do our work about why we do what what we do.